As soon as Danika Kapeikis learned to walk at 16-months, her parents opted to put her on the ice instead of placing her in daycare. 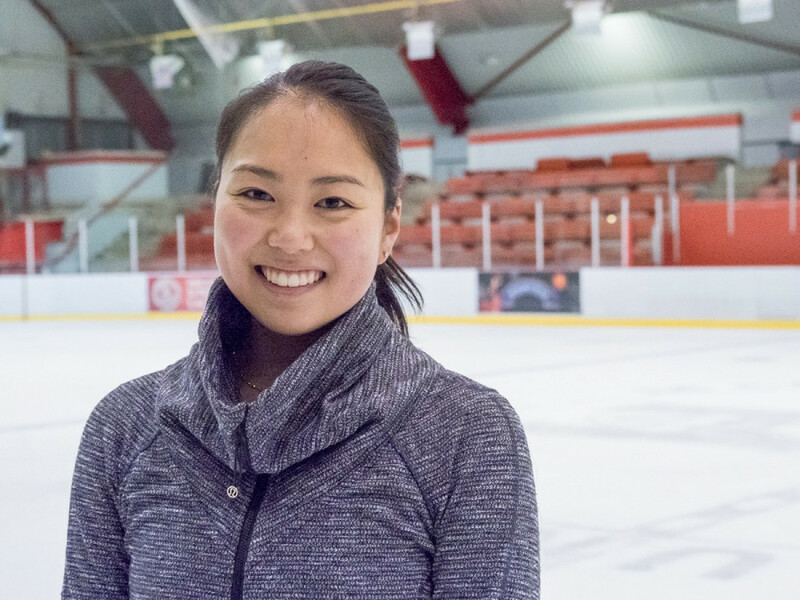 Now a kinesiology student at McGill University, Kapeikis has found a way to incorporate her identity as a figure skater into university life. Kapeikis is one of two captains of McGill’s figure skating team. She works alongside co-captain Lisa Nakajima and manages a team of 17 skaters. Kapeikis has been on the team and in university for two years, and Nakajima for four. The team’s season started in September, with tryouts on the 11th. On training days, the entire team wakes up at a time when many students are just getting to bed. Their practices are held from 6:30 to 8:00 a.m. at McGill’s McConnell arena. “We’re talking about university students who have gone out of their way to make the commitment to be on this team,” coach Eric Neumann said. Tabatha Cannon, an executive member of the figure skating team, would like to see the team go varsity. Neumann added that whether they’re sick, or hungover, they still have to show up to their practices. “We all have the same passion, so it makes it easier, and if you’re there it’s because you want to be there that early,” said coach Nancy Alexander. This year is a “transition” year for the team, with many members having graduated last year and several rookies welcomed to the team. Kapeikis said that they integrated well with the veteran members, bonding with them at their yearly Rookie Night event. Unlike other McGill teams, they don’t have a rivalry against The Stingers, as Concordia doesn’t have a figure skating team. Some members of the team would like to see that change in coming seasons, and would also like to see the team go varsity. “I hope that it expands more in Quebec. It would be really fun to have other universities within [the region] to compete against,” figure skater and the team’s vice-president finance, Gabriella Johnson said. After suffering an injury a few years before she started university, Johnson was looking for a way to get back on the ice while pursuing her studies. A former coach of hers used to be on the team and recommended it to her. Tabatha Cannon, a skater and executive member of the team, added it would be good to become varsity since the team is currently student-led and it would help to alleviate some of the pressure. “We’re student-run, so seeing something develop where we’d become varsity and that […] McGill funds us more, it would be a really good development because we wouldn’t have to organize the entire thing,” she said. The team only competes in two competitions a year, and while it would be difficult for them to have more competitions outside of the province, they would like to see a league of university-level figure skating teams develop in Quebec, so that they could compete more often. Because they aren’t varsity, they don’t get the opportunity to compete in the Ontario University Athletics championships, which Nakajima feels the team is more than capable of competing in. “I think that we have the potential to be [varsity] and I think that that’s something we should definitely work towards. […] We have the potential to do well, and so I think that in the next few years, I hope the team continues to kind of work towards that,” Nakajima said. The team’s first competition of the season is Nov. 23 at Carleton University, in Ottawa. “I’m actually super confident. We got a lot of great new skaters, and we have a lot of people returning that are also amazing. So […] I’m confident that we’ll do really well, and hopefully we’ll place again in synchro,” Cannon said. Last year, the team placed second in synchronized skating at the winter invitational. It was a huge victory for them and has them hoping for gold this year. “They don’t have a history of placing a lot in synchro so now that we know that we can, I think we’re going to try really hard and do as best as we can so we can do it again,” Cannon added. They have a few months to train for their competitions, but having to learn new programs and adjust to skating with new teammates means competitions come up a lot quicker than you’d think, Kapeikis explained. Kapeikis’ family was built off skating in a sense. Her parents met when they were skating with Disney on Ice, and they are now both figure skating coaches. Her older sister now tours with Disney on Ice, while her younger brother is a national competitor in the U.S. Figure Skating Championships. “It’s really nice for me, even though I chose more of a school route, that I’m still able to incorporate skating into my life and I’m able to share that with my family,” said Kapeikis. She’s tempted to pursue figure skating professionally, but Kapeikis is focusing on her studies for now. She appreciates that the team allows her to continue gathering the necessary experience, in case she chooses to go down that route after her graduation. “Especially talking with my sister, I know that life would be really fun and maybe it’s something that I would be interested in after I graduate, just to join a show for a couple of years,” she said. Co-captain Lisa Nakajima says she will be sad to leave the team after graduating at the end of the season. For McGill students who didn’t make the team this year, or who aren’t interested in making the team but still wish to skate, the club also holds open practices every Monday and Thursday morning, from 6:30 a.m. to 8:30 a.m., where students outside the team can skate alongside them. “We offer skating skills and developments for all skaters, so we want to make sure that they can maybe have a chance of making the team next season,” Alexander said. Neumann added that the team and the open practices are a good way for new students to adjust to their new surroundings. “The one big coalescing factor is you’re talking about a lot of people that come from different parts of the country, from different countries altogether and the one thing that binds them is the sport,” said Neumann. Their practices act as a space where students who want to make the team next year can practice, and for others to relieve some stress between classes. “Being in university can get really stressful with all your work and assignments that are due, but as soon as you get on the ice, you just feel like all that weight drops off your shoulders and […] you can focus that time on doing something that you love,” Kapeikis said. The team also has their annual Holiday show on the evening of Dec. 9. The show is a fundraiser to pay for the team’s expenses and competition fees. At the end of the show, the team invites all attendants to join them on the ice. After four years with the team, the end of the season will mark a hard goodbye for Nakajima, as she hopes to graduate from honours anatomy and cell biology, and move on to medical school. “[Skating] makes me really happy inside, I don’t know how else to explain it. I love it so much and I couldn’t live without it. It’s definitely really nice to have something else to focus on, other than academics,” she said. Why Doesn’t Concordia Have a Team? A figure skater from the age of 5 and Concordia Human Environment student, Jessica Bernardo, was disappointed when she found out the university didn’t have a figure skating team. 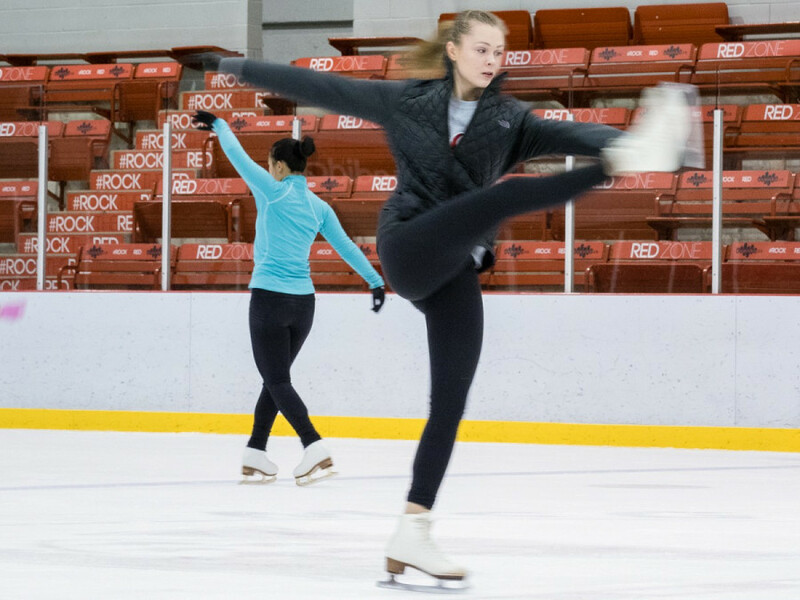 Nearly two years ago, Jessica Bernardo decided she wanted to start a figure skating club at Concordia, similar to the one at McGill. New to the process of starting a club and going into it alone, things quickly fell through. Nearing the end of a semester, she had started a Facebook group to see who would be interested in forming the team and realized that people’s’ interests weren’t matching up—there was an abundance of people who wanted to be coaches, but not enough who wanted to be skaters. There were also several people who were interested in joining once the club had been established, but not enough who were interested in helping to start up the team. She feels it would be best if a group of two or three people took on the task of starting a team, in order to make the process less daunting and more realistic. “I also think this is something that should get done over the summer, and completed at the beginning of the semester—we all know how chaotic it gets during the school year,” she continued. She added that while many students aren’t aware of it, Concordia’s arena does have free skating times that students and staff can take advantage of, as is the case with the McConnell arena at McGill. The schedule can be found on Concordia’s website. A previous iteration of this article gave the wrong date for the team’s Holiday Show, which is on Dec. 9. The Link regrets this error.